Last month, iCarol announced that they’ve adopted the Open Referral format for publishing easily-reusable resource directory data. This is a very exciting step toward a future in which reliable data about health, human, and social services is easy to find and use across a robust ecosystem of different systems and services. Here in Ontario, we are already have a story to share about how this shift towards interoperability is improving our ability to deliver critical information to our communities. The Mowat Center, Ontario’s non-profit public policy research center, published a report on the potential of open data that specifically identified the value of opening 2-1-1’s resource data. 211 Ontario stewards a network of more than 30 different referral providers operating across Ontario. This integrated provincial system includes both local 2-1-1s and other specialized referral providers that focus on specific populations (like child and family health, aging and disability assistance, etc) — working together with common infrastructure, standards and processes, ensuring that people in Ontario can access the 211 service from anywhere in the province. Each provider within the system is considered a steward of data for a designated geographic area; they are responsible for updating and adding records for their area, and these updates are automatically published to our province-wide system. This enables our local partners to maintain their local data, while 211 Ontario aggregates this knowledge into a coherent whole. In partnership with iCarol, and leveraging the Human Services Data Specification, we are now developing a new web platform with new search capabilities to provide accurate and timely information to the public. Behind the scenes of this platform, data from numerous local databases from across the province is aggregated to create a high quality data store of community, social service and health resources. This data store is a significant step towards Ontario’s goal of implementing an ‘open data’ repository, the foundation of our 211 technology platform. We’re eager to promote access to this data as a public good, accessible to all of Ontario’s public and civic institutions. 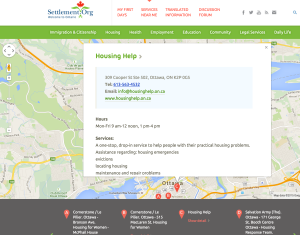 Settlement.org (a project of the Ontario Council of Agencies Servicing Immigrants) may be the first example of ‘2-1-1 as a platform’: this site for immigrants pulls its service directory information from 2-1-1 Ontario’s Open211 API. In fact, 211 Ontario has already demonstrated what we believe to be the very first Open211 API, with the Settlement.org project launched a few years ago. This website was specifically designed for newcomers to Canada, and its functionality was greatly improved by our ability to deliver targeted resource directory data in real-time. This is a good example of how ‘machine-readable’ 211 data can promote broader access to information about services – a key goal for 211 Ontario. In 2015, 211 Ontario worked closely with iCarol to automate the process of exporting data from iCarol into a SQL database hosted in Microsoft’s Azure platform. This new cloud-based infrastructure enables us to access data in near real-time and present high-quality and accurate information to the public and service partners through a variety of channels, including online. The below figure illustrates how the public will access and navigate the new 211 Ontario resource directory when launched later this year. 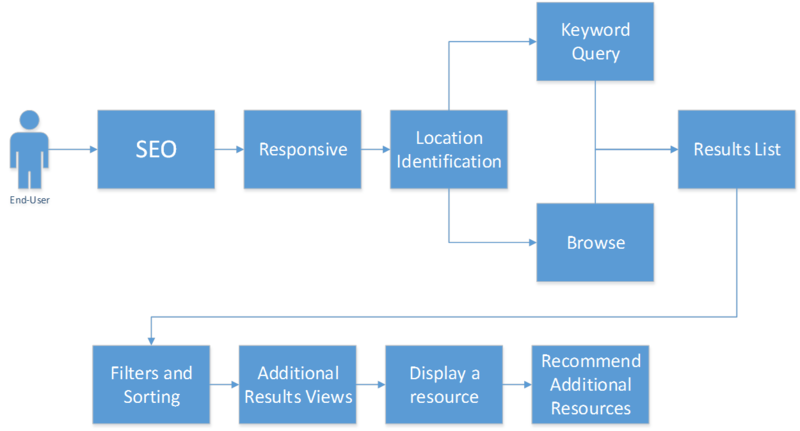 A user’s pathway to resources via the upcoming Ontario 211 search portal, which is modeled on the Open Referral format, and built in Microsoft Azure. We think this is an exciting example of the kind of innovation that can now be pursued by other iCarol customers— as well as any referral provider who adopts the HSDS to publish data. And we believe that so much more is possible. By shifting towards standardized open data, 211 Ontario can support new kinds of knowledge mobilization— such as enabling alerts, subscriptions, sophisticated performance evaluation, etc. We know, for example, that resource data is needed by professionals who are in positions of helping people every day — and who want this information right within their own workflow. Likewise, government agencies often spend precious resources to maintain resource directories on their own websites — and this is a use case that we can directly support. The Ontario NonProfit Network recently published a strategic report that highlighted 2-1-1’s resource data as a critical input for the work of need assessment, program evaluation and strategic investment. We are proud to join our provincial government at the forefront of the global open data movement. We’ve been inspired by the community of practice that has assembled in Open Referral, and we’re excited to contribute what we can to an emerging ecosystem of different tools, applications, ideas, and institutions. Now we look forward to see what might come next in this movement. Blog, Pilots canada, research and analysis. permalink.